Outdoor shower and coffee stoop looks out to the backyard woods. 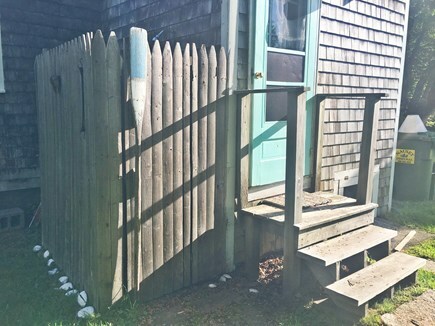 Lodged in the nostalgic, grassy, beach neighborhood of Lower Road right off Cape Cod Bay, this little cottage is surrounded by conservation land and is a quiet 10-minute walk to the beach (we clocked that with a glass of wine and a dog on a leash). 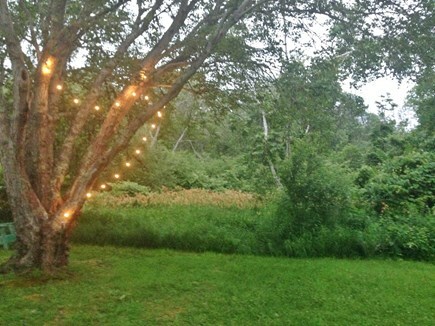 Enjoy the secluded back yard that backs onto conservation land, an old-fashioned wooden swing, a rocking chair, big shady trees, hydrangea bushes, wild grape vines, day lilies, lots of grass for badminton, and a deck with outdoor seating for coffee or dinner, or to watch the fireflies reign over the yard in July. There is an outdoor shower for post-beach afternoons and warm summer mornings. Indoors is cozy and sweet. A small but open floor plan includes a living room with sofa and rocking chair, books and puzzles, and a TV for rainy days. 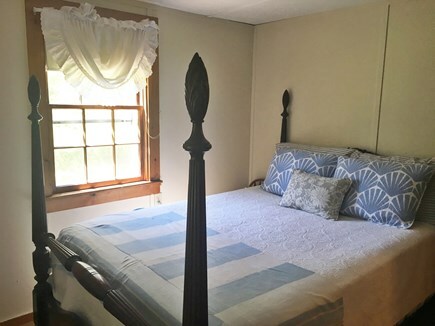 A window AC unit for the main room is available for the hottest days. 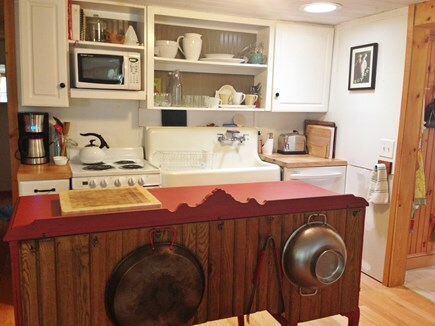 The farm-style kitchen and dining area are adjacent and seat up to 8 for dinner. An old sideboard that doubles as a work island always looks and feels great with flowers and summer fruit and berries. Fried seafood, ice cream and a liquor store are each less than .8 mile down the road, and Brewster's historic General Store is .9 mile in the other direction. 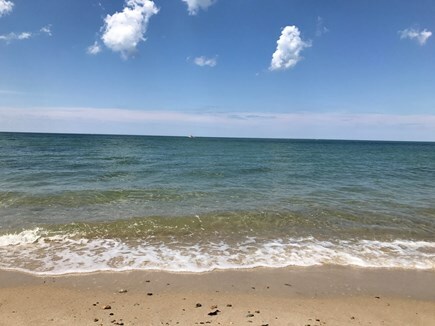 Brewster's shorelines have many bay beaches, and while the closest walk is Saint's Landing, you'll find Mants, Paine's Creek, and others a short distance away as well. It's not uncommon to see fox, rabbits and other wildlife around the neighborhood. In the the morning, you'll certainly hear the songbirds if you take your coffee or tea on the deck or back stoop. The cottage is winterized, so if you are here off-season or have a cold night, there is a thermostat to control the heat. We share a PDF with all information about the house, the surrounding area and our favorite restaurants and local spots to every guest, with a printed copy at the cottage as well. Additional availability info: Some spring and fall weekends available for 2-night stays - please inquire. This is a Saturday to Saturday vacation rental. Long-Term Rental (1 month or more): We are open to long-term rentals this year for the right person. There is some care that goes into making sure the pipes don't freeze because we don't have a basement, but please contact us if you are interested. Additional pricing info: Linens only included July and August prices - please inquire for other linen pricing. State and local taxes of 14.45% will apply. All bedrooms are on the first floor - there is no ramp to the house but there are just a few steps up to the deck and house - no staircase. 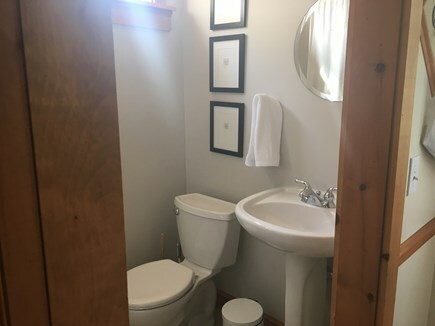 Do caution that the house is quite small so a wheelchair would not fit in the bathrooms or hallway. 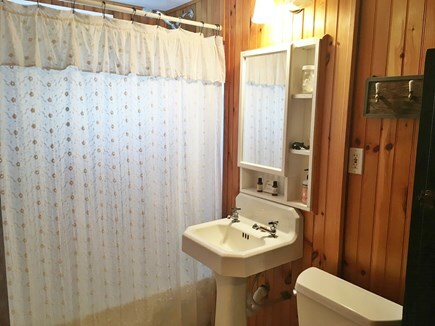 We’ve rented this cottage for several years now and always thoroughly enjoy our stay. 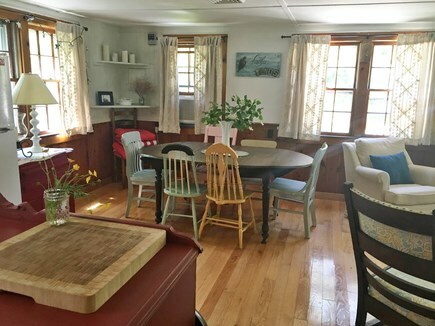 The house is very Cape Cod- a simple cottage full of charm. It’s well equipped with anything we’ve ever needed and an easy walk to the beach. Great yard and we particularly love the outdoor shower. This cottage felt like home the minute we entered. 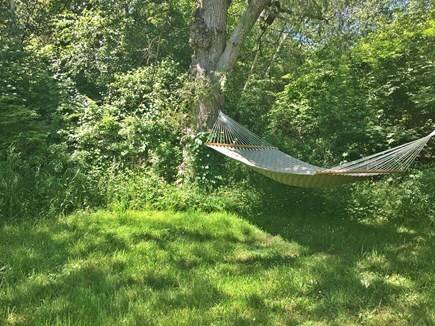 It has everything you need - comfortable furniture, nicely decorated, crisp sheets, games, puzzles, a guide to the area, an outdoor shower, deck and bbq for dining, and the most inviting hammock ever! We absolutely loved it and the owner is lovely as well. I have been vacationing in Brewster for 30 years and I highly recommend this cottage! We have stayed at Feather Winds for a week in June for the past three years. 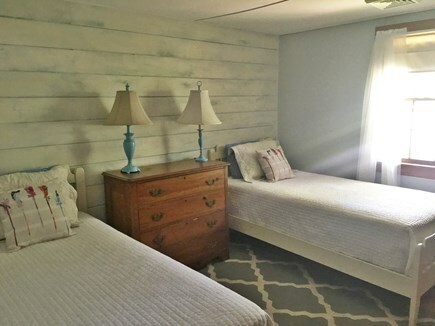 The cottage is very charming, comfortable, and accommodating. Its beautiful yard and deck offer great outdoor relaxation, and a beach is in walking distance. 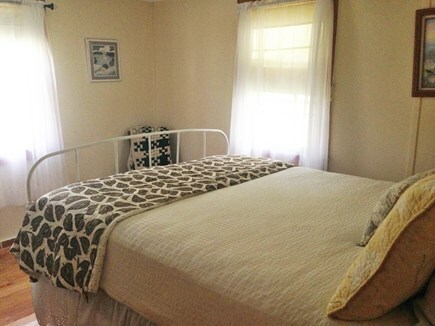 The cottage is near quaint shopping areas and there are many Cape Cod attractions a short drive away. We look forward to our weekly stay there for many more years! We are new to WeNeedaVacation.com as we wanted to get away from the corporate feel of our old listing. We've been renting out this house since 2014 and most of our guests are return renters. We are a couple living in Geneva, Switzerland where Oliver works for the UN. Liz was born and raised as a year-round resident on Cape Cod, working at B&B's and scooping ice cream during the summers. Oliver is from the mountains in Montana and knows good hospitality from his family's cabin rental near Yellowstone. Liz's parents live about 1.5 miles from this cottage and help manage it, as well as handle any emergency questions and issues while guests stay at the house since we are six hours ahead. We are happy to provide references from many past guests while we build up our reviews here on weneedavacation.com. We hope you'll enjoy this home and the sweetness of the Lower Road bayside neighborhood as much as we do. 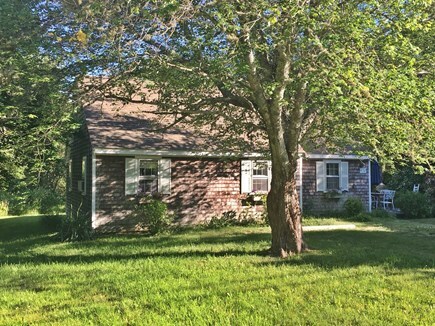 While this is a simple cottage, its location and its yard are really tucked into one of the sweetest pockets of Brewster. Diagonally across the street is Brewster's old cemetery, which is worth a visit to see old sea captain's burial sites dating back to Brewster's first settlers. 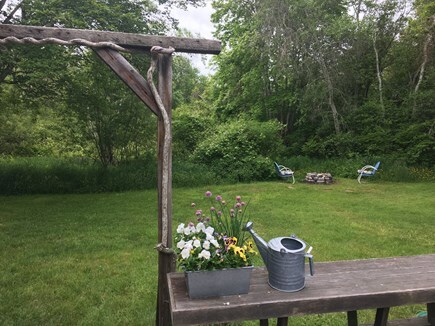 Brewster Conservation Trust has put a walking trail just minutes from the cottage through the woods, and the community gardens are across the street from the trailhead. The yard itself, though not enormous, feels very secluded. Big trees and shrubs grow high and make both adjacent houses nearly invisible from the backyard. 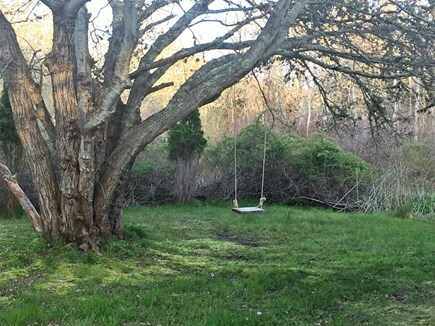 Across the street is conservation land, so when you're at the house, it really feels like a little hideaway, even though it's perfectly close to some of Brewster's best beaches, ice cream, shops, and more. This part of the Cape is about as sweet and quiet as it was 20 years ago. Brewster was established in 1803, and this neighborhood is less than a mile from the historic buildings built by sea captains in the 1800's, including The Brewster Ladies Library and The Brewster Store, both a short bike ride from the cottage.